Shop for chewing lice treatments for pets at VetDepot.com. There are two primary classifications of lice: sucking lice (Anoplura) and biting or chewing lice (Mallophaga). There are about 460 species of the former and about 3,000 species of the latter, which are the most likely to affect your cat or dog. Chewing lice consume the skin, fur, or feathers of their host, as opposed to sucking lice, which feed off the blood of their host. "Complications associated with excessive scratching and biting can occur if your pet’s lice are not treated quickly." Lice infestations are relatively rare on pets and are most often seen in unclean conditions. This is a notable difference from human lice, which have no association with poor hygiene. Lice are strongly species-specific. Lice that affect dogs, for example, stay on dogs, lice that affect cats stay on cats, and human lice stay with humans. In other words, you and your children cannot catch lice from an infested pet, nor can your pets catch lice from you or your children. You may become suspicious that your pet has lice because of periods of excessive scratching or biting at the skin. Itchiness is the main symptom of an infestation, resulting from the presence of the lice and their feeding. Of course, the primary sign of a lice infestation is the presence of small, flat, wingless lice on your pet or the presence of nits, or lice eggs, affixed to hair shafts near the surface of the skin. Check for lice and nits by parting your pet’s hair methodically under strong light and examining the base of the hairs and the skin. Pay close attention to the head, ears, face, neck, back, legs, feet, and tail during your examination. While lice are visible to the naked eye, it is usually easier to spot their eggs. Complications associated with excessive scratching and biting can occur if your pet’s lice are not treated quickly. 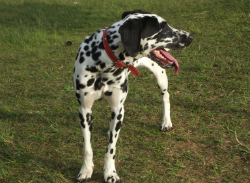 Cats and dogs may develop hair loss or injure themselves in cases of continuing and severe itchiness. These injuries can also become infected if they aren’t kept clean. Another risk of a lice infestation is transmission of internal parasites. Lice are external parasites, but cats and dogs can inadvertently ingest them while grooming or biting at itching skin. If the ingested lice are infected with intestinal worms, these subsequently pass to the cat or dog when the lice are digested. Lice are easily treated with an insecticide application. 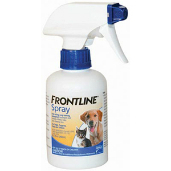 Frontline Plus and Frontline Spray are effective products commonly used on cats and dogs for lice, flea, and tick control. If your pet has particularly long or matted hair, you may need to trim it down prior to treatment. Consult your veterinarian before using any insecticide product on your pet.